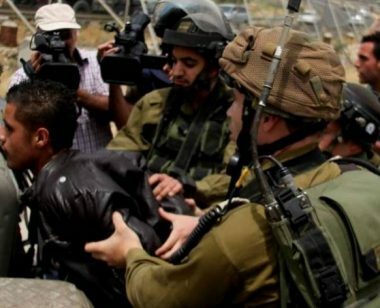 Israeli soldiers abducted, on Thursday at dawn, at least eleven Palestinians during violent invasions and searches of homes across the occupied West Bank, and confiscated thousands of Shekels in Hebron, the Palestinian Prisoners’ Society (PPS) has reported. The Israeli army claimed its soldiers located a Carlo rifle in Qabalan town, southeast of the northern West Bank city of Nablus. The PPS office in Bethlehem, south of occupied Jerusalem, said dozens of soldiers invaded the al-Khader town, south of the city, searched many homes and abducted Ahmad Mohammad Salah, 24, Mohammad Khader Mousa, 27, Zein Mohammad Issa, 21, and Yousef Taiseer Issa, 22. In Kifl Hares town, west of the central West Bank city of Salfit, the soldiers abducted a young man, identified as Amjad Amin Saleh. In Tulkarem refugee camp, in the northern West Bank city of Tulkarem, the soldiers abducted Fayez Samed Abu Safeera, 21, from his home. The soldiers also invaded and searched many homes in the southern West Bank city of Hebron, and several surrounding towns, before abducting Jihad Mohammad al-Allama, from Beit Ummar town, north of the city. Also in Hebron, the soldiers invaded and ransacked the home of a political prisoner, identified as Abdul-Mahdi Zohour, from Beit Kahil town, northwest of Hebron. Furthermore, the soldiers illegally confiscated a Palestinian car, and 100.000 Shekels from several homes in Beit Ola town, west of the southern West Bank city of Hebron. The invasions into Hebron also targeted homes in several neighborhoods in the city, in addition to Tarqoumia town, west of Hebron and Beit Anoun, north of Hebron.